Aliens have invaded. 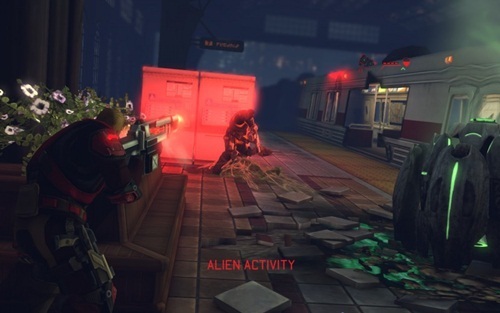 Humanity’s only hope is with XCOM, a group of the world’s best soldiers funded by nations across the globe. Our single mission is to fight off the alien threat. Like most government institutions, the XCOM project is depressingly underfunded. We’re trying to save the world on a budget, and the eyes of humanity are upon us. Worst of all they’ve foolishly put me in charge. This is a story of desperate survival, global warfare, and maybe… just maybe… the end of the world. This is XCOM. We’ve encountered the aliens a couple of times. The XCOM project started out well. Our base was set in the United States, but we had an additional satellite over China searching for UFOs. After one month of skirmishing with the aliens, the council overseeing XCOM give me an A for my work so far. I’ve minimized casualties and trained an elite squad of soldiers capable of beating back the alien threat. Let’s meet the team. Schneider: Heavy, meaning she carries a rocket launcher. She hails from Germany. She’s a squadie, only one rank above rookie. She’s a loose cannon but she gets the job done. Jordan: He’s an Assault man. First to enter a mission and last to leave. Jordan is a brave American who’s been with XCOM since day one a month ago. He and the others are all corporals, one rank above squaddie, but Jordan is always the guy to lead the team into battle. Harrison: He’s a Support guy from Canada. He’s the last to enter a mission and first to leave. As the reasonable one of the group, he likes to stay in the back. Martinez: Another Heavy, this one from Argentina. He has a lot of pride in Argentina and humanity in general. He wants to make his country proud. Things have been proceeding normally for the first month, but then we get an unexpected call from the top dogs of XCOM. Apparently some idiot general in India got his unit killed and now he needs us to rescue him. The leaders of XCOM are under the impression that if this general dies it’ll spread panic throughout India, so now my team has to risk their lives just to save this one guy. It’s like Saving Private Ryan but with more lasers. We find the general in the rubble of a collapsed bridge. The aliens are on the other side doing their best to kill us. Harrison demonstrating the elite standards of XCOM by completely missing his target. Jordan rushes down and covers the idiot general while he runs for it. An alien on the other side of the bridge fires a laser into Jordan’s chest, nearly killing him. He has one hit point left and he’s pinned behind a car. The idiot general gets on the dropship so now we just have to mop up the rest of the aliens. Mop them up… with bullets. One of the aliens on the other side goes into overwatch, meaning he’ll automatically shoot if someone enters his field of vision. Martinez enters his field of vision. He’s trying to help Jordan out. Martinez is a Heavy. He has a rocket launcher. We’re having trouble hitting the aliens on the other side, and Martinez thinks if only he could get in closer he could blow them all to hell. He runs for the car that Jordan’s hiding behind. He doesn’t make it. One of the aliens shoots Martinez three times with his laser gun. Martinez dies right next to Jordan, who’s on the brink of death as well. Schneider sees the chaos from the cliff above and panics. 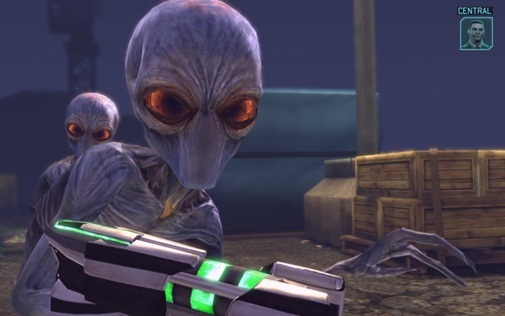 Here’s the thing about XCOM soldiers… when they panic, they really panic. She goes crazy and tries to shoot Harrison in the face at close range. By some miracle she misses and Harrison begs her to pull it together. She does, but the aliens on the other side of the rubble are still shooting at us and Jordan is still stuck next to Martinez’s corpse in the pit below. Harrison: You tried to shoot me! Schneider (voice just above a whisper): Hey, I get the job done. She squeezes the trigger and shoots one of the aliens in the head. There’s only one left. He charges up the cliff straight at the last remaining alien. He charges right up to the alien’s face and fires. If he misses or doesn’t get the kill, the alien will shoot back at point blank and finish the wounded Jordan off. Jordan’s shot hits its mark and the final alien’s head is blown to pieces. Mission accomplished, but Martinez was KIA. 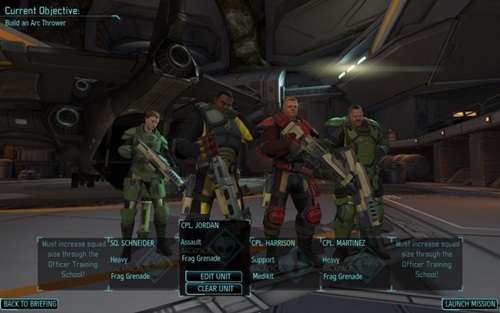 It was the first time XCOM lost anyone with a rank above squaddie. He was a good soldier, but we have to move on. Schneider is promoted to corporal. She takes the place of Martinez as top Heavy. Harrison: You’re tried to kill me! You’re a ticking time bomb! You’re out of control! Schneider (voice just above a whisper): I get results. They continue to go on missions together. It’s awkward. As time goes on, a new recruit from Australia begins to make a name for herself. She’s a sniper named Taylor. Two floaters, mechanical flying aliens with attitudes, pin Schneider in a parked train. Schneider had been working her way through the train when the floaters shot through one of the walls and attacked. They have jetpacks yet they still want to take the train. Now that’s lazy. Harrison and Jordan try to save her but can’t get close enough thanks to some bogeys on the other side of the train taking shots at their flank. Harrison’s still missing, but at least now he’s missing with a neat laser rifle. Enter Taylor, a young Australian squaddie with no reputation at all. Taylor: Leave it to me, mate. I used to snipe dingoes in the bush all the live long day. Harrison: What’d she just say? Taylor snipes one of the floaters through a window of the train so Schneider could take out the other one. Taylor immediately joined my A list squad. She’s a young up and comer to watch out for. One of my planes shoots down an actual UFO. I need to send a ground team in fast to clean up any surviving aliens and pick the ship clean of technology. 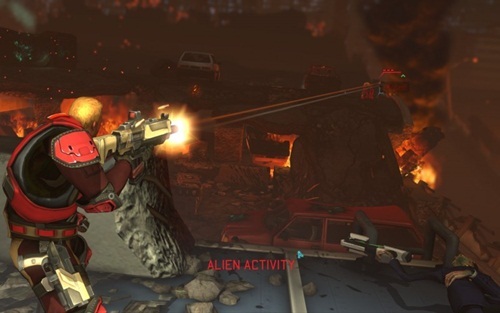 The scientists over at XCOM have been pressuring me to pressure my team into bringing an alien back alive. I decide that now is the time to attempt this arguably stupid idea. My egghead scientists propose we use something called the arc thrower, a little wand that shoots a stunning electrical pulse at very close range. The need to get in close makes it exceptionally dangerous. Naturally, I hand the arc thrower to a rookie and tell him to prove himself or die trying. To my surprise, he actually does. While the aliens are locked in a firefight with the rest of the squad, he sneaks up on a thin man, an alien in a human disguise, and stuns hims for capture. You say his chance of capturing the alien is 70 percent. I say is chance of the alien turning around and shooting him in the throat is 30 percent. Davies (the rookie): Could you learn my name now? I took the time to learn yours. Harrison: Sure thing, new guy. 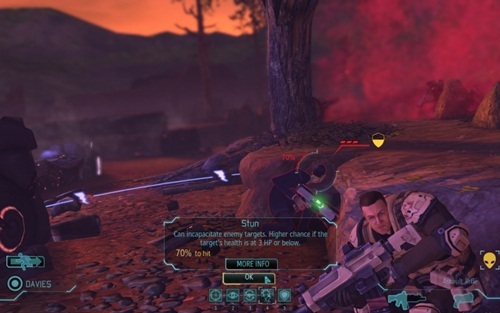 As they’re standing there, a shot is fired into the group of XCOM operatives. One of them dies. In a movie, this is where the rookie dies and no one cares. This isn’t a movie. A streak of green light cuts across the sky, and Harrison falls to the ground with a mortal wound. Unless someone uses a med pack on him in three turns he’ll die, and as the medic he’s the only one with a med pack. He dies. Taylor whirls around and finds the killer, a floater flying just over the crashed UFO we’d been looking for. Taylor: Crikey that was a ripping shot! Whadyasay I snipe this jumbuck shagger right in the donger? Taylor takes the floater out in epic fashion. We continue the mission, but Harrison is dead and never coming back. He was the highest ranking member of XCOM. We needed him. Now Jordan is the highest ranking member. Both he and Harrison have been with the project since the beginning. Before Jordan has time to grieve the mutons show up. I hope they come in peace. There’s a shootout in the trees. We can see the crashed UFO, but it seems so far away. Jordan heads up the front, as usual. He moves right next to one of the mutons and blows his head off. Schneider fires a rocket into one of the trees. 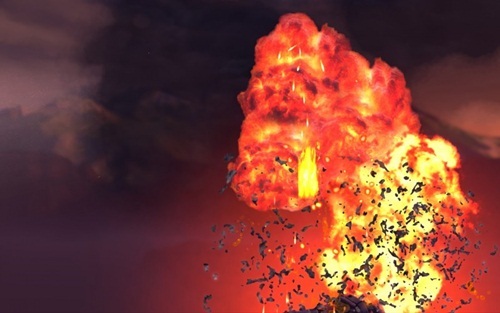 The muton taking cover behind it is engulfed in flame and dies. There’s only one left. Davies the rookie attempts another flank maneuver that worked so well in capturing the thin man. He moves from tree to tree and gets in behind the last muton. He takes his shot. The muton attacks back, but not at the rookie. Instead, he throws a grenade at Jordan. We lost our two best guys. Taylor the sniping Aussie sends a bullet right between the last muton’s eyes. The other soldiers get aboard the UFO and secure it without too many issues. Mission accomplished, but at a terrible cost. The aliens have increased their attacks. I order two new satellites so we can scan and protect more of Earth, but it’s not enough. Supporting countries can encourage them to keep funding XCOM, but with so many attacks across the globe I can’t make everyone happy. I install the satellites over Russia and Nigeria. Russia because they’re contributing more money to XCOM than any country accept the United States. Nigera because they contribute a lot and I want to get a foothold on another continent. The month ends and I get a report from the council overseeing XCOM. 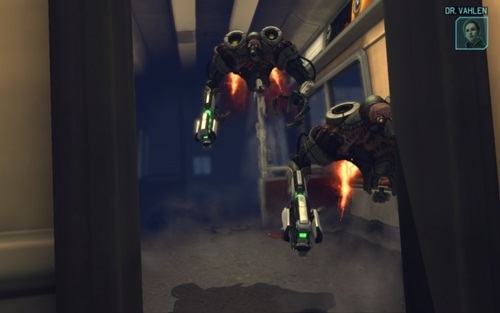 Germany and South Africa have grown fed up with a lack of support from the XCOM project. They’ve chosen to withdrawn their funding and have officially left. After her home country of Germany leaves XCOM Schneider continues to do missions for us. It’s awkward. The council gives me a C for the month. We’re slipping up, but I think I have a way to turn things around. We’ve located an alien base on the surface of Earth. I’m ordering my best team to attack it head on. If this goes well XCOM will be back on track. If the mission fails we could spiral into chaos. I’m Robert Green, a novelist who enjoys writing about video games in his free time. For more of my stuff check out RobertGreenStories.com.